It started with 736 clubs dreaming of a money-spinning run but this season's FA Cup is already down to 392 teams. The third hurdle on the road to Wembley - after the extra preliminary round and the preliminary round - will see another 116 eliminated over the next few days as clubs battle for a second qualifying round place. There's a 43-year-old former Premier League striker and FA Cup semi-finalist taking part at this stage as well as the team whose joint managers are brothers. BBC Sport takes a look at some of the stories to feature in the first qualifying round. Check out this weekend's FA Cup fixtures. Waterlogged pitches, international call-ups, floodlight failure... all frequent reasons games have to be rearranged. But when was the last time you heard a match had been been moved because of a cheese show? Frome Town's tie with West Country rivals Chippenham Town has been brought forward from Saturday to Friday because it clashes with the town's biggest event of the year. The Frome Agricultural and Cheese Show attracted 20,000 visitors last year and officials of the Southern League Premier Division club acted amid fears the attendance would be hit if the tie was not rescheduled. "Chippenham are only a few miles down the road and we'd like to think we could expect a crowd of around 500 or 600," Frome secretary and managing director Ian Pearce told BBC Sport. 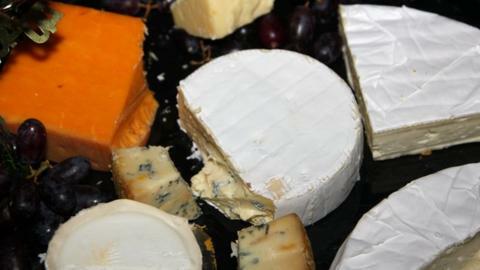 "But the cheese show is huge, the biggest event in the town's calendar. "It would have had a big knock-on effect in terms of the attendance had we not re-arranged the date. "A lot of our fans like going to the cheese show, including our chairman, Jeremy Alderman, who is one of the show's sponsors." Frome, who play in the seventh tier, have former Hearts defender Jake Hutchings in their squad. Barry Hayles will be 44 when the 2016 FA Cup final takes place on 21 May, but Chesham United's former Premier League striker has no plans to retire. Hayles, who played three seasons in the top flight with Fulham, scoring 13 times in 75 appearances, is showing no sign of slowing down after joining the 13th club of his career in the summer. "A few of the boys tell me I'll still be playing at 50," joked Hayles, ahead of Chesham's home tie with Aylesbury. "Seriously, I will keep on playing until my phone stops ringing." Hayles's enthusiasm for the game - he made his debut for Stevenage Borough, a non-League team at the time, in 1994 - is as strong as it was when he was scoring against Chelsea and Tottenham. The 2002 FA Cup semi-finalist played for Truro City last season, making 550-mile round trips from his London home to the Cornwall-based club for games. Hayles is player-coach at Buckinghamshire-based Chesham, who play in the Southern League Premier Division. Having served under ex-England boss Kevin Keegan and Wales manager Chris Coleman during his professional playing days, Hayles is keen to embark on a managerial career. "I started my playing career in non-league and worked my way up. I want to work my way up the coaching ladder too," he added. Chesham manager Andy Leese said: "Barry is incredibly fit and his appetite for the game is phenomenal. "He might be 43 but he can still out-run players a lot younger than him." Alsager Town have already rewritten the club's record books this season by winning back-to-back FA Cup ties for the first time in their history. The Bullets - nicknamed because of the Royal Ordnance Factory in the area, now BAE Systems - will compete in the second qualifying round for the first time if the North West Counties Premier Division's bottom side see off Burscough. It will be a remarkable turn of events if ninth-tier Alsager do, four years after their future was threatened when fire ripped through the clubhouse and changing rooms at Wood Park Stadium. "It was an asbestos building so it was condemned to be demolished," chairman Terry Greer said. "All that was left was a pitch. "For about four months we played every game away from home." The Cheshire-based club have risen from the ashes since the fire, caused by an electrical fault, in 2011. New changing rooms and a clubhouse have been built while Alsager have earned £3,425 in prize money for advancing to the first qualifying round after defeating Barnsley-based Athersley Recreation and Shaw Lane Aquaforce this season. Alsager Town were compensated by Crewe Alexandra last season when midfielder Ryan Wintle, 18, joined the League One club on an 18-month contract. Defeat eighth-tier Burscough and they will pocket a further £3,000. "Until this season we had not won an FA Cup tie since 2006," added Greer. Arlesey Town are banking on a brotherly double act to propel them on a money-spinning run in this season's competition. Former Norwich City striker Zema Abbey and his younger brother Nathan, the ex-Luton Town goalkeeper, are in charge of the Southern League Division One Central team. The eighth-tier Bedfordshire club, whose former players include ex-Brighton striker Craig Mackail-Smith and ex-Reading forward Dave Kitson, are away to Brentwood Town. "Nathan and I both have our own opinion and it is not always the same. We agree to disagree," said Zema, 38, who is 15 months older than his sibling. "We have our differences but we know how to speak to one another in the right way." Zema scored seven goals in 59 league appearances during four years at Norwich between 2000-2004. Nathan's former clubs include Brentford and Chesterfield. "We played together at Boston United and we also played against one another in a reserve game when Nathan was goalkeeper at Northampton and I was a striker for Norwich," added Zema. "I remember he denied me with a lucky save." It is not often a club from the ninth tier can boast a former Germany youth international who grew up playing alongside Philipp Lahm at Bayern Munich. Former Nottingham Forest midfielder Eugen Bopp, 32, came out of retirement at the start of the season to sign for Midland League Premier Division Dunkirk, who are away to Belper Town. Manchester United midfielder Bastian Schweinsteiger was a year below Bopp at Bayern's academy, but it is Germany's World Cup-winning captain Lahm whom the Ukraine-born player remembers fondly. "We grew up side by side before we took our own paths," Bopp told BBC Sport. "I went to Nottingham Forest at the age of 17, Philipp stayed at Bayern Munich." Nottinghamshire-based Dunkirk are managed by Nick Hawkins, a former team-mate of Bopp's at Forest. Hawkins was part of the Chasetown team that went from the FA Cup preliminary round to the third round in 2008 - and is desperate to repeat the feat as manager of the Boatmen, whose ground is situated on the banks of the River Trent. "We entered at the extra preliminary stage and have already won £3,425 in prize money for getting through two rounds," said Hawkins. "That's an awful lot of money when you are a club with a weekly budget of £200-£300." Blyth Spartans enter the competition this weekend and will be looking to match last season's run to the third round, where they lost 3-2 to Championship side Birmingham after going 2-0 ahead. That lucrative run earned them about £100,000 profit, and they were rewarded with an appearance by the FA Cup trophy at their club on Thursday. "It was fantastic for the supporters to have the trophy here, a few hundred came down to take pictures with it," manager Tom Wade told BBC Sport. "To get so far in the competition last year was like winning the World Cup. "The prize money was invested in various projects such as installing a water irrigation system for the pitch because the water pressure at the club is very poor. "The pitch was reseeded and there was a general tidying up of the ground. The clubhouse was done up with a new toilet block put in and a total redecoration of it with new tables and chairs. It all costs money and soon disappears." Blyth face a tricky tie at north-east rivals Spennymoor Town on Saturday. There are 392 teams competing at this stage with winners receiving £3,000 in prize money. North West Counties League Premier Division Runcorn Linnets, who are away to Washington, have scored 14 goals in 270 minutes of FA Cup action this season.